The world population is growing and young folk are being introduced at infancy to smart phones. By the time they have money, taking serious pictures as a committed hobby is part of their normal world for over ten years! It’s therefore not surprising that compact phones don’t seem to be much more useful than cell phones. If they want to be more adventurous, then a more capable phone with lenses capable of detail rich scenes and far away wildlife becomes a worthy challenge. So the Mirrorless cameras become a prize to aspire to and acquire for the enthusiast and then the amazing DSLRs for those who find an optical viewfinder magical! In this setting, as the new cellphone-trained and highly experienced imaging generation grows up, more advanced than compact digicams will be needed for them. Will both propel technology to the point that each sensel well, collecting light, will be a separate “sensel-camera” with filling of the sensel wells controlled independently according to setting of noise, binned resolution and color mapping algorithms. I do not despair in the slightest for the fate of our cameras, except for nostalgia about the almost complete passing of film. About film, I could paraphrase Mark Twain saying "The reports of my death are greatly exaggerated". Film is still available. About the number of cameras sold, there have been about 1.5 billions (give or take 100 millions...) smartphones sold, each including a camera. Even if that number was lower than expected, it dwarves the number of ILC sold (about 9-10 millions on the image...). 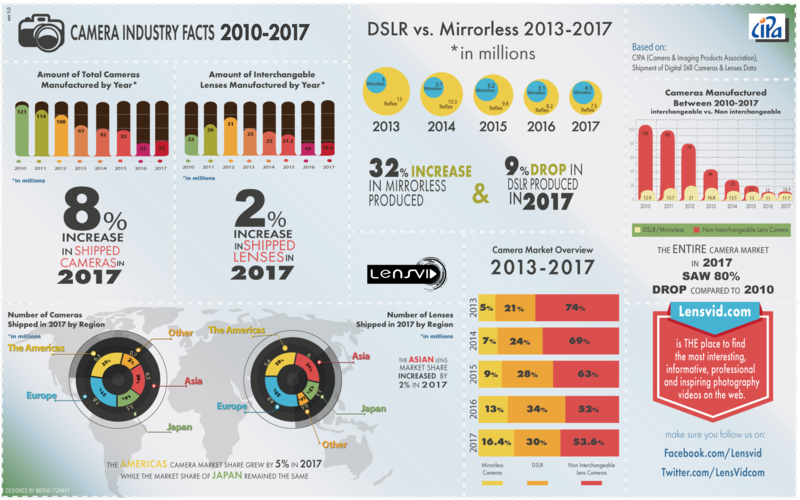 But... surprise, surprise, we have had a wealth of camera news in the past year, including the two major players announcing a new mount, a complete change of the digital MF market and more recently Panasonic joining the Leica mount. Interesting times. The reason, I would think, is less photography than video. 8K is around the corner and that changes a lot of things. About the number of cameras sold, there have been about 1.5 billions (give or take 100 millions...) smartphones sold, each including a camera. That Jerome, we would agree is the massive ecomic engine with brisk capitalistic free market competition that is moving the technology so fast that one could buy a better phone almost every 6 months. Apple cannot doze or have his afternoon nap or LG will chew up their balls! But the companies that make the miniature optics and electronics cannalso feed and worry the regular camera market. This energizes the big camera companies to stay alert and burn the midnight all and listen to photographers and hunt for competitive edges in design and MFR and even in menu creation. Who would have thought Pentax and then Fuji would revolutionize pricing in the MF market? The new Leica-Panasonic-Sigma consortium L camera is I think going to be a strong stimulus and put further pressure on the DSLRs. These are not only “Interesting Times” but also a surprising new era in fine well thought out compact new tools, financed by enthusiasts and celebrated by professionals for the new lighter options and ability to reach into the dim lights of cathedrals! The next revolution will be pixel based cameras, and sensels exposed until they have counted enough electrons! It might come first in a smart phone, simply because of their scale of market! In low light they would bin the shadows and AI would remake the detail! It is amazing to me that the internet world has become obsessed with the financial well being of camera companies. I can’t understand it. If a big corporation with no interest in anything other than the bottom line is hurting or can’t survive, then that is part of the game. For that matter, if cameras or photography the way we know them disappeared in the next five years - that is a process that can pretty well be counted on in any art, craft, trend or technology over time. I happen to like the Olympus brand and mindset, but if Olympus went out of business tomorrow, it wouldn’t change my world one little bit. The 4 and 5 year old camera models and lenses I currently have will keep me shooting every day for several years years. And if they die or I want to get another body or different lens next week or next year, there is a boatload of used gear of every brand and type online for a fraction of new price - that would keep me active for the next 10 or 20 years or more. Maybe in a few years I will feel the need to return to old film cameras. Who knows. I know I am apparently an odd ball not caring if camera companies survive or not - and not caring about the features of every new camera or lens brought out or rumored about, and then complaining when it’s too big or too small or doesn’t have a radical new higher megapixel sensor or feature. 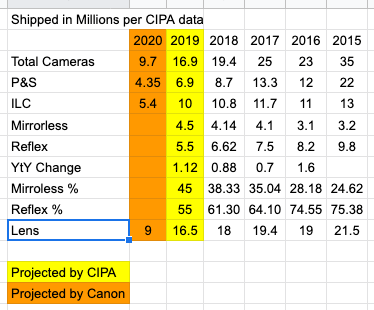 I’m seeing these silly spreadsheets by normal people who like cameras, everywhere on the web - as if the ones posting and commenting on them are stock advisors or investors in the company - and as if the rest of us should care or base buying decisions on those figures. Cameras are not investments. They are just over priced disposable consumer electronics. If someone who likes taking pictures can make use of one of the products for that purpose, then hopefully they find joy and satisfaction in being able to do so. However, Robert, if there was no Ricoh GR, or PS945 Cooke lens or a The Zuiko Digital ED 12-40mm f2.8 PRO lens for your Olympus, then really magical tools would be missing. So they are not merely overpriced electronics. In the right hands, certain lenses and camera are simply superb and distinctive in some way. By having competitive manufacturers thriving, the tools offered are up to date with less flare, great resolution and can be used often without adapters and either way it’s a lot of fun! But I admit that if not one more camera, (outside of cell phones), were to be made from now on, it would not effect or limit the quality of work that a dedicated photographer can produce.... and it might be more fun. I am thinking of putting a 47.5” Red Dot Artar in the back foot of an old ford van and have the focus board on a track inside it! So they are not merely overpriced electronics. In the right hands, certain lenses and camera are simply superb and distinctive inbsone way. I like technology and make use of it. Would I make use of a 12-40 f2.8 for $1250 (CDN) or a 300mm f4 for $3300 (CDN) if they were given to me? Probably/maybe. I find full satisfaction in my photography without having them and am not hindered by some fantasy that they will change or improve my photography. They won’t. To address your point, if there was no Ricoh GR, or PS945 Cooke lens or a The Zuiko Digital ED 12-40mm f2.8 PRO lens for your Olympus - it wouldn’t affect my ability to photograph and satisfaction in doing so - one bit. Obviously I don’t have any of them lol. If people want to spend their money on such luxuries, that is their privilege of course. I’ve known many people who have collections of very expensive cameras and lenses - showcase and brag about them - and have never taken a serious picture with any of them. Many wedding guests show up with Canon or Nikon top end bodies and 85mm 1.2 lenses or 70-200 f2.8 —— far bigger investments and more impressive gear than my modest selection. It’s all show. I’m the one who was hired because I can make a photograph that matters to the couple. Now of course if I am garnering $5,000 day rates that benefits from using specialized gear and where the cost can be justified - then the purchase may be called for - and I would be happy that it is available to me. My reply really has to do with this obsession on the internet of normal people who like cameras and photography and are worrying and even panicking and making or not making purchase decisions based on such utterly useless statistics that should really only be concerns for stockholders and investors in a company. I’m not picking on the person that posted this thread, but the copycat fashion that these spreadsheets are being posted everywhere with grave concerns being expressed for the companies or the industry. It is amazing to me that the internet world has become obsessed with the financial well being of camera companies. I don't think so. Probably, the Internet as the algorithm presents it to you because it knows you are a photographer has become obsessed with cameras. I doubt that Bob and Jane, who are not interested in photography, think the same. It is amazing to me that the internet world has become obsessed with the financial well being of camera companies. I can’t understand it. My worry is that the camera companies will shut down and I will lose after sales support. Another is that I cannot buy a new model of camera body beyond the year 2050 that supports the EF mount natively. I am thinking a new EOS-1D X Mark III will be released for the 2020 Olympics since Canon will not be ready with a mirrorless for the big white lens. It would be nice to see a 7D III. Huge changes have taken place in the last 40 years that I have been serious about photography. I can’t imagine what we will use or if there is even value in being a photographer in 2050. Corporations, businesses, industries, technologies come and go regularly. Why worry. It will do nothing to change what takes place. I try to worry about things I have control of. That is likely true, Jerome! It’s not the lack of “privacy” that offends me the most about Facebook and data mining. It’s the step far deeper than intimacy. They know what my preferences in all probability are likely to be before I have even been presented the choice! They know my preferences better than I do. So “what” I see is fed to me, creating a world I believe is far more Asher-friendly, that in fact it is! Since we are as humans living in countless, overlapping “bubbles of delusions”, anyway, we accept the internet as being the actual world as it is. In fact, we are all seeing the internet offerings tuned our aggregated profile! .....but you knew that well before I did and shared your insights. My next task is to be succinct!